Donald Trump, or, as we all seem to know him, ‘The Donald’, has raised a complaint with the Scottish Parliament regarding a wind turbine farm that has been constructed in view of an expensive golf course that he has just completed. It seems that The Donald doesn’t mind sustainable energy, as long as he doesn’t have to look at the wind turbines themselves. 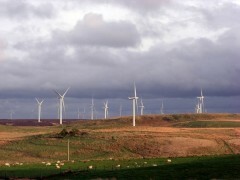 The Scottish Parliament Energy and Tourism Commission listened to complaints from Donald Trump on the topic of wind farms and specifically the wind turbines that can be viewed from what he is calling “the best golf course in the world” in Aberdeenshire, Scotland. The Donald seems to feel that the wind farm turbines are horribly ugly and that the Scottish government is making a big mistake by erecting these ‘monsters’. When requested to give any evidence of his opinion, The Donald simply stated that he was the evidence. It was his personal opinion, and that really should be enough. Apparently, he feels the wind farms are ruining the beautiful landscape of Scotland, and, because his mother was from the Isle of Lewis, his opinion should be enough. But the argument didn’t really stop there. The Scottish First Minister, Alex Salmond, who is a big proponent of the sustainable energy efforts, seemed to be a direct target of The Donald. Word has it that The Donald was originally told the particular wind farm in question would not be erected, but the story later changed. The fight between the two powerful men has been literally taken to the streets as they have been seen arguing about the topic in the news. The multimillion dollar investment in the golf course area was based on the promise of no wind farm, and it seems that a former good relationship between The Donald and Salmond has fallen to the wayside. The Donald made his case before a surprised group, as he made sure that they realized his thoughts, opinions and dollar investment were the only thing that counted in the discussion. One might argue that, from a business side, The Donald did have a point, however, as in every business agreement: it needs to be in writing. The Donald left the meeting to be greeted outside by a number of people; some cheering him on but most of them swearing at him. The billionaire from America may be used to these kinds of confrontations, but it was not a normal day that usually happens in the Scottish Parliament Energy and Tourism Commission. I think everyone has a clearer picture on where Mr. Trump stands on renewable and sustainable energy. Like many businesses, it will only make sense when it applies to the bottom dollar. In this case, The Donald doesn’t like the view, no matter how beneficial the final outcome is to Scotland and the earth. Posted on June 13th under Wind Energy Systems.